August 5th, 2014 - It was a thrilling moment when Xenocs unveiled the new Nano-inXider vertical SAXS/WAXS system during the opening reception of the 23rd IUCr Congress in Montreal. This exciting new extension of the Xenocs SAXS/WAXS system portfolio provides a comprehensive solution for the characterization of nanomaterials and features unparalleled performance and ease of use in a compact package for simple integration into any lab environment. The ergonomics and high performance of the Nano-inXider are impressive. Not only is it a beautiful machine to look at, but it has also been designed to be comfortable and easy to use. Due to its vertical design, it also has the smallest footprint on the market. "The Nano-inXider offers unique performance for nanostructure characterization. It integrates all of the key technologies that Xenocs has developed over the last 14 years", Xenocs CEO Peter Høghøj explained. Features like: Xenocs Clean Beam Technology, full system control software, advanced data analysis software, integration of the latest generation of detectors from Dectris are all integrated in the system. These key features are also embedded in the Xeuss 2.0 - Xenocs other high performance SAXS/WAXS solution. 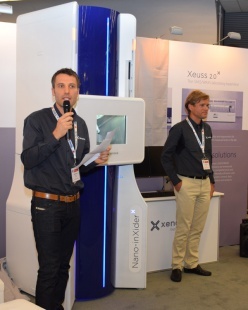 The launch of the Nano-inXider, along with the launch of the Xeuss 2.0 SAXS/WAXS laboratory beamline in June at PP2014 in China, establishes Xenocs as the innovative leader in the SAXS/WAXS market today. Xenocs has boldly positioned themselves to be the one-stop shop for nanomaterials researchers that are new to using SAXS/WAXS technology as well as those that are already experts in the field.